Very well built, massive capacity, works well and looks good. Too big for smaller kitchens - see measurements for more details - other than that it's very good. Looking to buy a large solo microwave? The Panasonic NN-ST462M features a massive 32 litre capacity, and a 340mm removable glass turntable. Finished in silver, it looks smart, and build construction is very good, as you'd expect for the price. As you'd expect it's not the smallest - overall exterior dimensions are 52.5cm by 31.0cm by 38.8cm, and weight is in the region of 11.5kg. 19 Auto programs are built in, including cook, reheat and defrost, which implements the Panasonic Chaos Defrost system. Also featured are 6 different power levels and a child lock to avoid accidents. The controls are touch based, which are well labelled, with black text against a blue/grey background. Overall our testers were very impressed with this model - granted it's not the cheapest, but it does provide extensive cooking options, as well as featuring a larger capacity than the majority of it's competitors. So who is this silver microwave aimed at? We'd recommend it to larger families and households - it will fit the vast majority of dishes due to the huge interior ( 35.5cm by 25.1cm by 36.5cm ), which is finished in acrylic for easy cleaning. Overall the NN-ST462M is an excellent large microwave, with an incredible 32 litre capacity, easy to use controls, and a whole host of settings and functions. Recommended. I am thinking of buying this in white version. Will the interior peel or rust. I am used to one with stainless steel inside. 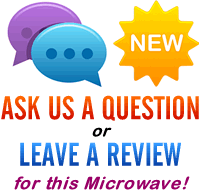 Hi Lynda – it’s a while since we saw this microwave, and a quick check online suggests that some models may have a steel interior, and some the acrylic white one – so it might be worth checking to see which it is prior to purchasing. 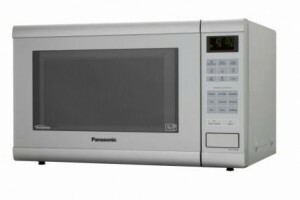 That said, we’ve never had any issues with the acrylic interior of Panasonic microwaves, and their customer service is pretty good too should any problems arise. Hope this helps! Hi Helen – As far as we’re aware this will fit – hope this helps!